Whether you're new to teaching or a seasoned pro, school owner or part-time assistant, the Teaching the Teacher conference is for you. Our conference presenters are women of high skill and deep experience. Like our membership itself, they represent a wide range of martial arts styles, and hold a common desire to share what they know for the betterment of all. Network with other women who love and teach martial arts. Learn from successful instructors and school owners with decades of experience. Improve your best practices for sustaining your school and adding value for your students. 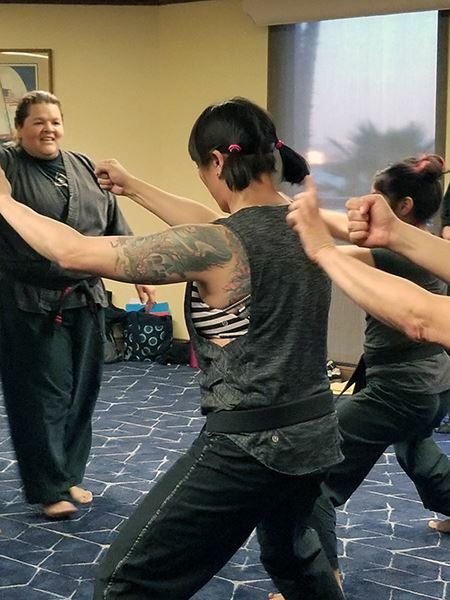 Share your expertise, and support other women in the martial arts and self-defense communities. Relax and be the student instead of the teacher! Applaud your colleagues receiving Rank Promotion or Recognition, or entering the Hall of Fame. The conference is held in the first quarter of each year, at varied locations in the U.S.... but always in a hotel setting with classroom space, workout space, excellent and reasonably-priced accommodations, and warm weather! “It was so fun to get to attend this year. I learned so much and am implementing as we speak. It was great to make more connections and get to know folks more in this intimate environment. Even if I can’t make it, I am going to make sure to send student teachers every year!" Classes may take the form of lecture/discussion, or “moving classroom,” where participants practice while they learn. The Association of Women Martial Arts Instructors is a non-profit organization. ©2019 All rights reserved.